Gradually during the course of the twentieth century human activity began to create a new form of high altitude cloud. 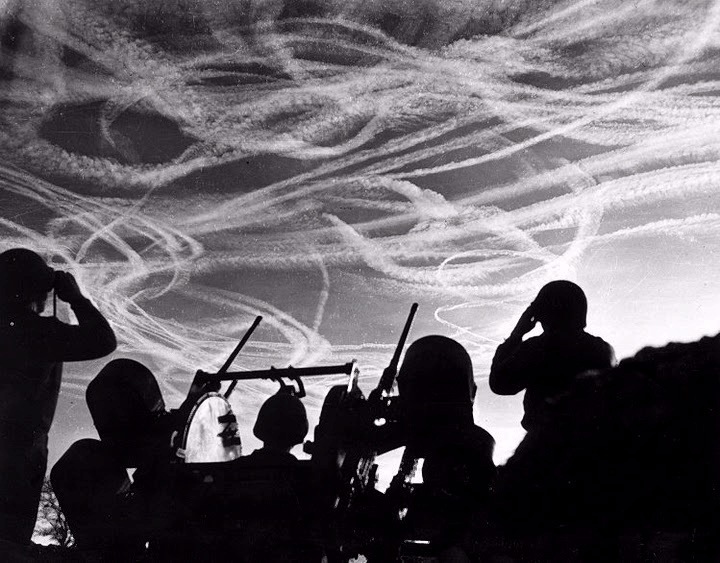 As aircraft began to fly at increasingly higher altitudes in the decades prior to World War II they occasionally began to leave visible trails in the upper atmosphere. These came to be called "contrails", short for condensation trails. 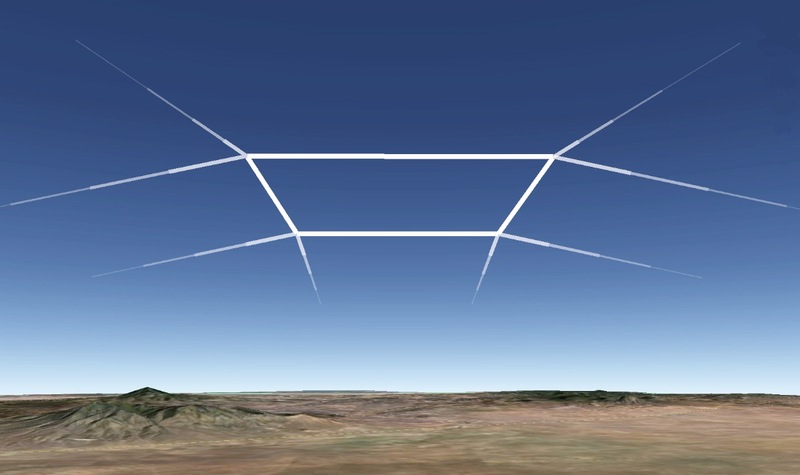 These visible markers of passage were a unique cloud form in the history of the planet. Contrails are inherently linear, resulting from the passage through the air of a craft whose very support depends upon rapid movement. Belonging to the family of cirrus clouds, contrails are only formed at high altitudes, above 26,000 feet. Contrails are usually formed by condensation of the water vapor which is the primary by-product of the combustion of fuel, but they can also be formed by the disturbance of the air caused by aircraft wings or propellor tips. Depending upon atmospheric conditions, contrails might not be visible at all but when conditions are right they may persist for hours, gradually expanding from their linear forms into a continuous cloud canopy. Due to the frequent presence of high winds at these upper altitudes, contrails can quickly disperse into irregular, natural-looking forms mimicking natural cloud formations. At times, the natural appearing delicate cirrus clouds in the upper atmosphere are almost completely man-made. A few recent linear contrails might be readily apparent, but in fact, the whole formation consists of contrails in various stages of dispersion. With the advent of large-scale commercial jet travel, contrails have become ubiquitous. 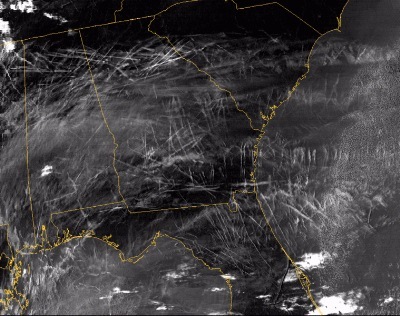 Under certain conditions, the thousands of aircraft in the skies over the US at any time can produce a dense network of linear forms which can quickly drift into more natural-looking cirrus. This phenomena is far more prominent over the continental United States and Western Europe, where the density of jet traffic is the greatest. 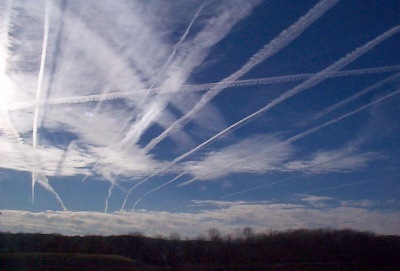 Over much of the earth, contrails are relatively infrequent. They are in effect a highly visible marker of the presence of an advanced technological culture. Climatologists suspect that the cirrus clouds resulting from contrails are effecting the earth's climate but there is no agreement on how. 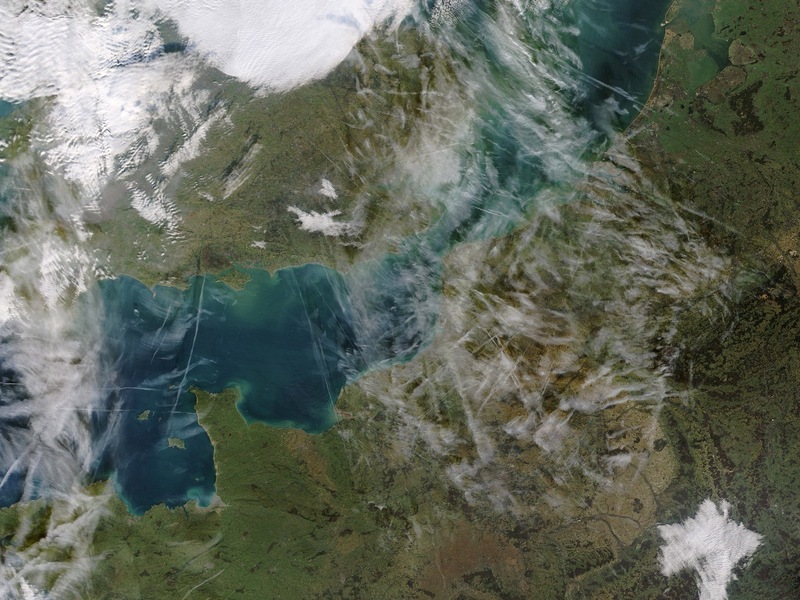 Some scientists believe the clouds shadow the earth, reducing surface heating, while others suspect this synthetic cloud cover actually raises the earth's temperature, by trapping heat. The phenomena is an area of active study. 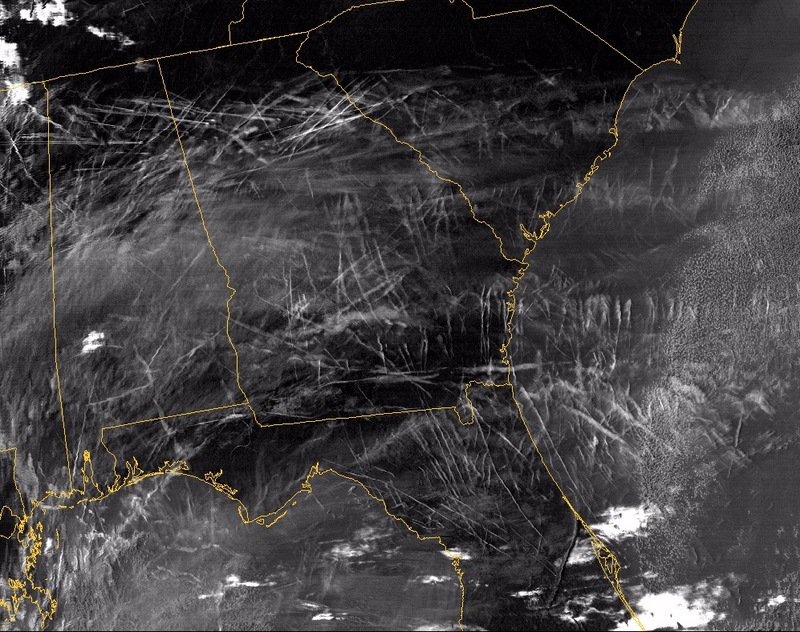 During the three days after 9/11 no aircraft flights were permitted over the US and this provided climate scientists a unique opportunity to study the effect of contrails. For the first time in decades, there was a total absence of contrails. The results were not conclusive, however. A one degree increase in the average temperature between day and night was observed, but this may have been due to especially clear skies. 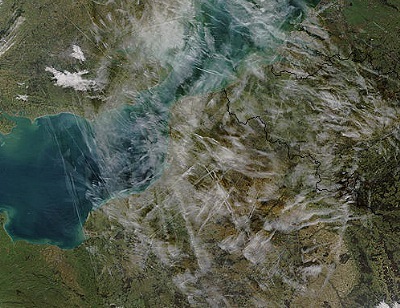 The forms of contrails reflect the condition of the culture on the ground below. During times of peace the forms of contrails tend to be straight lines as the result of the pragmatic agenda of air transport. During times of war contrail forms can be wildly convoluted, transcribing the frantic patterns of aerial combat encounters or "dogfights" as they came to be called by military pilots; aircraft continually twisting and turning to obtain an advantage or evade an attacker. As an artist I am interested in making large scale, ephemeral drawings with unconventional media. The inherently linear nature of contrails makes them an excellent candidate for use as a drawing tool. A bit more cumbersome than a pencil or charcoal, the drawing tool is a turbine aircraft flying at high altitude close to the speed of sound. However, when compared to some of the drawing tools I am interested in, like artificial meteors or rockets, making a drawing with contrails is a relatively tractable problem. Several aircraft will be instructed to simultaneously fly planned routes, determined by GPS waypoints, forming rudimentary drawings of unmistakable basic geometric forms. Unlike the pseudo-random meanderings of contrails which create inadvertent drawings whose form is determined by airline scheduling, destinations and the routes of the air traffic control system, these drawings will irrevocably confirm that the aircraft forming them had no other purpose in their travel than to make the drawing itself. The drawing will be the exclusive rationale for the path of travel of the aircraft, not an accidental outcome. These drawings have several objectives. The obviously deliberate geometric form appearing in the sky as the result of normally ignored contrails will serve to draw attention to this phenomena, enhancing awareness not only of the natural environment, particularly the sky, but also enhancing awareness of the magnitude of the effect of human activity on the sky and the environment as a whole. Once a drawing is executed, the effect of the upper atmosphere winds will cause it to gradually dissipate, and the linear geometric forms will gradually disappear, becoming indistinguishable from naturally occurring clouds. This mimics the inherent ephemerality of human activity. These drawings evoke the long history of Land Art, particularly in the American Southwest, but with a more environmentally aware consciousness. Certainly, it possesses something of the grand gesture of a masculine Land Art, stamping an individual presence on the landscape, but this is substantially moderated by its ephemerality. Like historical Land Art, it moves the sphere of art activity into a new theater, but with a consciousness of the disruption any expansion of human activity entails. Enhancing awareness of this disruption, already omnipresent, is a component of the work which is largely missing in historical Land Art. But on another level, it is also a boy looking up at aircraft high in the sky, and wanting to form a drawing with the lines of their passage. High altitude aircraft flights are a factor of concern for environmentalists and climate scientists. In addition to the possible climate effects of contrails, such flights distribute combustion products like NOx and greenhouse gases like CO2 in the delicate upper atmosphere. Aviation�s overall potential for influencing climate was recently assessed to be approximately 3.5 percent of the potential from all human activities. While not major, it is certainly a cause for concern, to the point that some environmentalists advocate restricting airline travel to only the most essential trips. The expansion of the international art fair calendar and art tourism certainly might require some defense in the eyes of these activists. The forecast growth of international air travel could push aviation's influence on climate to over five percent by 2050. The making of these drawings certainly has an environmental cost and impact. Approximately 160 gallons per hour of jet fuel per aircraft will be consumed in the production of these drawings. This will result in about 3500 pounds of CO2 being released into the atmosphere. In addition, other gases and particulates will be emitted into the upper atmosphere. Most art production (except perhaps that of conceptual art) has an environmental impact such as the volatile hydrocarbons emitted from oil paints or the toxic gases released by art foundries. Worldwide commercial air travel consumed approximately 205 million tons of aviation fuel in 2005 and that figure is expected to double by 2025. In terms of the total amount of aviation fuel burned by commercial aircraft worldwide and the resulting environmental impact, a drawing requiring four hours of jet flight would involve an additional impact of about .0000000000263 percent. To some environmentalists using jet aircraft to make an ephemeral drawing in the upper atmosphere might not seem defensible. And in this light these drawings are intended to be provocative, inspiring debate about the social value of art. If we are to restrict our use of aviation to only essential purposes is art production, distribution, or even appreciation to be included in our list of essentails? In a world where any expenditure of energy and use of fossil fuels requires a cost-benefit analysis how are we to evaluate the social benefit of art? Can a flight to visit the Louvre be considered essentail? What about a flight to visit one's dying parent? Will we be forced to develop a metric of the social value of various activities? How are we to value art environmentally? One very real objective of these pieces is to stimulate such a discussion. You can find the US EPA report on the environmental effects of contrails here and an ICAO report on the affect of aviation on climate change here. 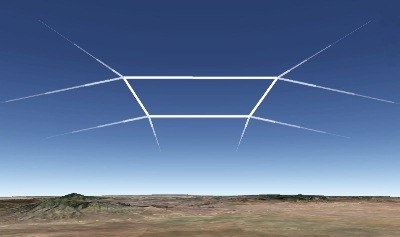 The conditions for the formation of contrails are not always present. The presence of high level moisture along with specific temperatures produce a range of contrail visibility, from contrails which dissipate rapidly to highly persistent contrails which disperse into natural-looking cirrus forms. At any given moment only approximately 10-20% of all jet flights cause contrails. It is therefore essential to be able to accurately forecast the conditions required for contrail formation. Luckily, two different agencies have produced contrail forecasting systems. Both systems employ data from an international network of weather or sounding balloons, launched from over 800 locations worldwide, which measure atmospheric conditions from the ground up to 25 km or more. By analyzing this data reasonably accurate predictions of contrail formation for a specific site may be made. Contrail forecasting systems have been developed by the Cloud and Radiation Group at NASA Langley Research Center and by the University of Alaska, Fairbanks. Of particular interest is the NASA Langley tool, which permits the study of contrail conditions using archived historical data. 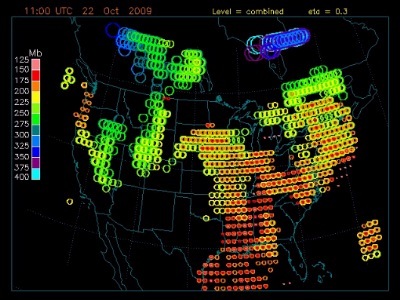 This will permit analysis of specific geographical locations to determine the frequency of contrail conditions and any potential seasonal trends. Since contrails are only formed above 26,000 feet, high performance aircraft are required. The most common type of privately owned and operated aircraft with this level of performance are corporate or business jets, bizjets for short. Often owned by corporations or wealthy individuals, there are approximately 11,000 aircraft of this type worldwide, with the vast majority of them based in the US or owned by US corporations. 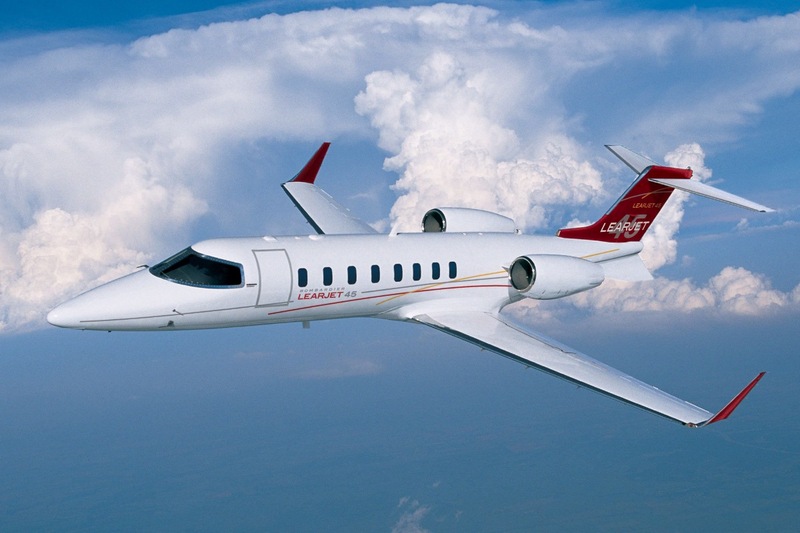 The relatively recent advent of so-called "fractional share" operators, businesses which lease a portion of the use of an aircraft, have resulted in what are effectively rent-a-jet providers. Examples are NetJets and FlexJet. In addition charter operators have proliferated who allow single ride jet hire such as ExecJets and Blue Star Jets. These developments have insured that a supply of aircraft of the required type are available for hire. The availability of hire bizjets permits a number of options for the realization of a contrail drawing. In perhaps the simplest approach, direct funding for executing a drawing is obtained from a patron or grant and the aircraft required would simply be chartered or rented. A second approach involves contacting either fractional share or charter operators and requesting a donation of aircraft and pilot time. This has the advantage of securing multiple aircraft in a single agreement. Finally, individual corporate and private owners are approached to donate use of a single aircraft. All three approaches are currently being conducted. The relative unpredictability of optimal conditions for contrail formation dictates that the aircraft be available over a staging period, perhaps measured in weeks. When the upper atmosphere conditions are optimal at the drawing site a decision will be made to execute the drawing. Due to the fact that normal usage of the aircraft may result in unavailability during the staging period, one or more additional backup aircraft are desirable. Albuquerque is in the upper right, Phoenix in the lower left. 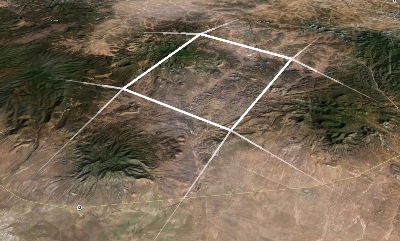 Note large areas without airways along the Arizona/New Mexico border. Contrail formation begins at altitudes above 26,000 feet. 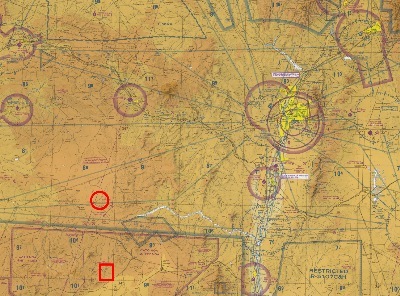 In the United States the airspace at 18,000 feet and above is considered Class A airspace and under international agreement flight operations in this airspace must be conducted on an instrument flight plan and under positive control by en-route air traffic control centers. What this means in that aircraft operating at these altitudes are not allowed to fly to arbitrary positions or on arbitrary flight paths but must adhere to specific plans requested in advance. In addition, the timing of flights, such as time of take-off, the time of arrival at a specific position, routing, etc. is not completely under the control of the pilots, but can only be requested and is ultimately determined by the air traffic control system. 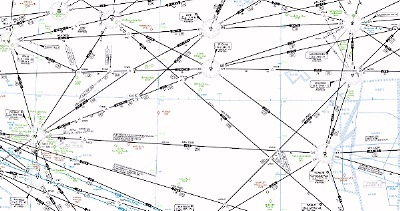 In order to have the flexibility to allow multiple aircraft to create a synchronized drawing close cooperation is required with the Federal Aviation Administration or FAA who is the controlling agency for US airspace. The creation of a contrail drawing involves one major factor which assists coordination with the FAA. A contrail drawing needs to be done at a location away from heavily traveled air routes in order for the contrail drawing to stand out from the random contrails of regular air traffic. Most aircraft travel on prescribed airways or "highways in the sky" connecting major cities and navigation aids. 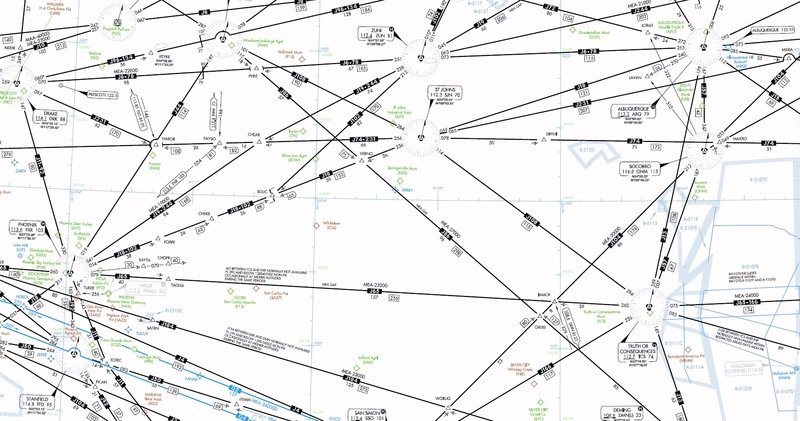 The need to execute the drawing away from major airways should simplify flight plan coordination with the FAA. 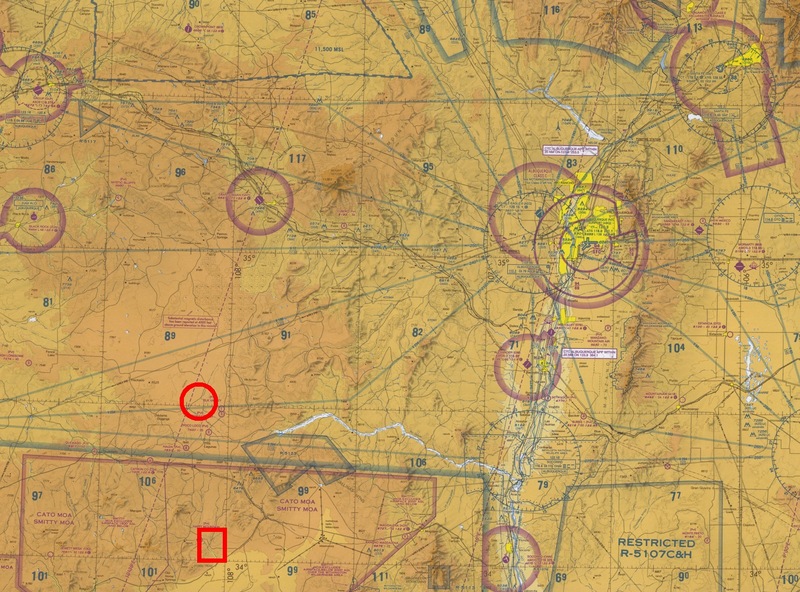 One possibility to actually prevent other aircraft from entering the drawing area is to request a TFR or Temporary Flight Restriction for the time and location of the drawing as is done when the President or other high officials visit a site. Such restrictions are also created during missile or spacecraft launches. Discussions will begin shortly with regional FAA officials in the Southwest for the initial planning of Drawing 1 described below. Looking up at the drawing from near Lightning Field. The drawing makes visible the coordinate system by which we orient ourself with regard to our planet. Humankind has defined the Earth's surface with the system of latitude and longitude since the time of Eratosthenes in the third century BCE. Rarely, if ever, do we see a visible manifestation of this basic system of division of our space. The grid structure also invokes the use of the grid by the 20th century avant-garde. Finally, the drawing attempts to impart a visual sense of scale to the planet, in that even though this drawing is immense by any standards, over twelve million such drawings would be required to cover the earth's surface. The drawing width of one tenth of a degree was chosen so that the drawing subtends about fifty degrees of arc when viewed from directly below. This is the acceptance angle of a standard photographic lens and is a good approximation of the normal field of view of the human eye. Bear in mind that the drawing will be about six miles above the surface of the earth. The drawing will be visible in its entirety from the ground over an area many times its size. The location may be modified as the result of discussions with the FAA. 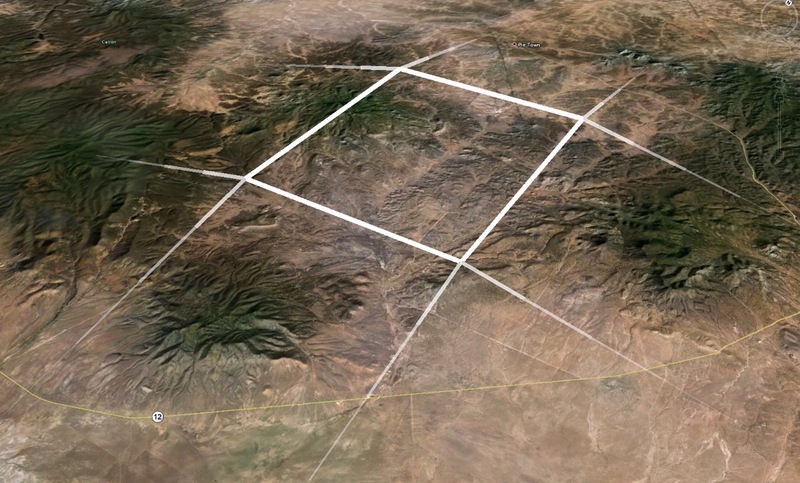 The Southwest was chosen as a site for the drawing for a number of reasons, the frequency of cloudless skies, the relatively uncrowded airspace, the proximity of volunteer aircraft, the artist's residence, and the close relationship of the area to historical Land Art. Santa Fe is in the upper right, Albuquerque below it. The site of Drawing 1 is outlined by the red rectange. The Lightning Field lies in the red circle. Four business jet type aircraft are required to make the drawing. Approximately one hour of flight time will be required per aircraft assuming the aircraft are departing Albuquerque or Santa Fe. Differing performance capabilities can be accommodated by mission planning and the requirement for the lat and lon legs to be flown at different speeds. Aircraft with similar contrail signatures (primarily determined by fuel burn) are desirable but again, differences can be accommodated by matching aircraft with the different length legs. It is desired that all the lines in the drawing be completed simultaneously, requiring that the different length legs be flown at different speeds. Each of four aircraft will have a unique flight plan comprising one of the four sides of the rectangle. Basically each mission profile will be to climb from below the visible contrail level to the first of two GPS waypoints, then fly direct to the second GPS waypoint, then to descend to below the visible contrail level and return to base. It is desired that all four aircraft are synchronized so that they arrive at their first waypoint simultaneously and fly the leg to the second waypoint over the same period of time, so the sides of the quadrilateral are drawn simultaneously. Because the length of the latitude and longitude rectangle sides are different this will involve differing airspeeds for each pair of aircraft. Winds aloft will also certainly require different airspeeds for each aircraft in a pair. Contrail formation occurs above FL 260 so it is assumed that the drawing will be done at about FL 300. It is also assumed that all four aircraft will fly at normal altitudes for their direction of travel and that aircraft on potentially intersecting flight paths will be further offset vertically. This small vertical offset of the sides of the rectangle should be indistinguishable from the ground. * The trapezoid outlines a cell one tenth of a degree (or six minutes) of latitude and longitude. Each extend over 360 degrees, thus for both there are 360 x 10 = 3600 tenth of a degree divisions. 3600 x 3600 = 12,960,000. Of course the meridians converge at the poles so six minutes of longitude become infinitesimally small at the poles while six minutes of latitude remain a distance of six nautical miles.